These three different razor blade packets have long histories. 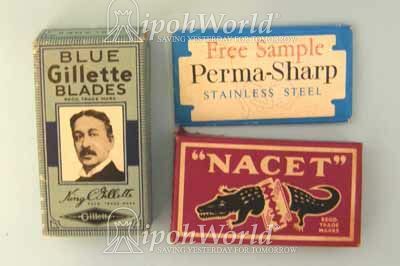 The Gillette story is related below and although similar detail is not available, there is evidence that Nacet blades were in use in Changi Prison by the POW's during the Japanese Occupation and the Perma-Sharp was certainly around in 1960. All the blades are inerchangeable and fit the standard Gillette Safety Razor. To read more about a brief history of the Gillette company, click here. To read the diary of a Japanese Prisoner of War (e-Book), click here.